Gives you unlimited new sounds. 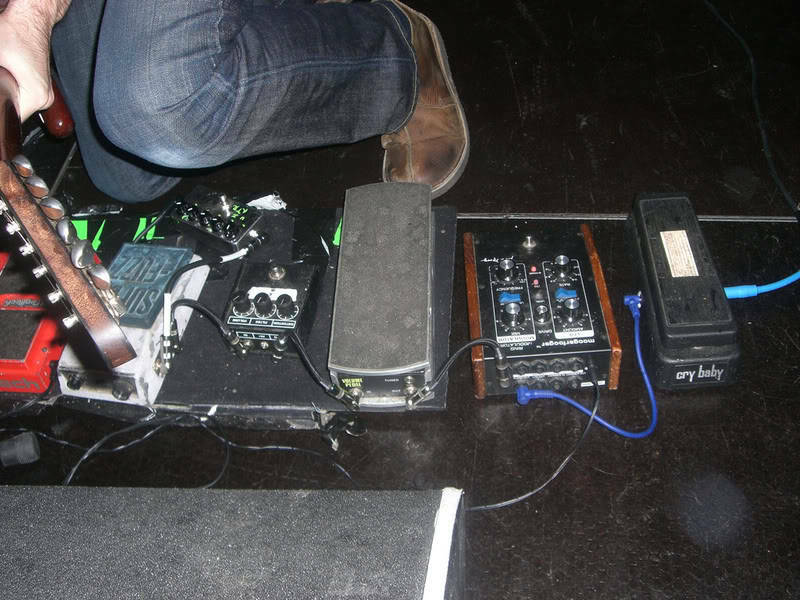 At the center of Omar's pedalboard, he has an older model of the Moog Ring Modulator. He used that effect in November 2009. "I use a real Hammond A100, customized by John Harburay out of Connecticut. My favorite Hammonds have always been A100s over the years; they seem to have something of a purer tone than a B-3. Live, the Hammond goes into two hot-rodded 122 Leslies and a Hughes and Kettner Puretone 100-watt amp driving a 4 x 12 cabinet. I use two effects on the organ: a Vermona spring reverb and a Moogerfooger ring modulator." At 19:17 of this "Rig Rundown" for *Premier Guitar*, Steve shows us his Moogerfooger which he says he uses for "wacky ring modulator effects." The MF-102 sits on the right-hand board. 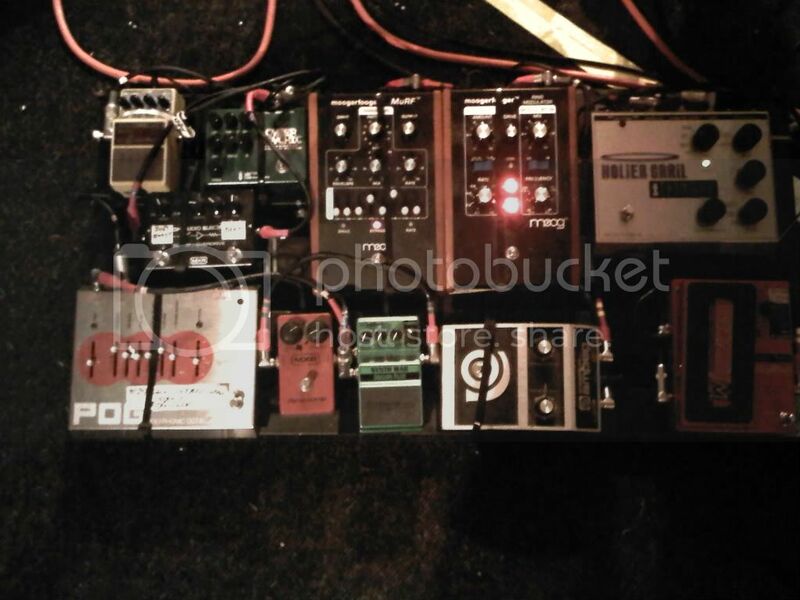 Showed up in a list of Alan Morse’ gear on the Spock’s Beard official website. 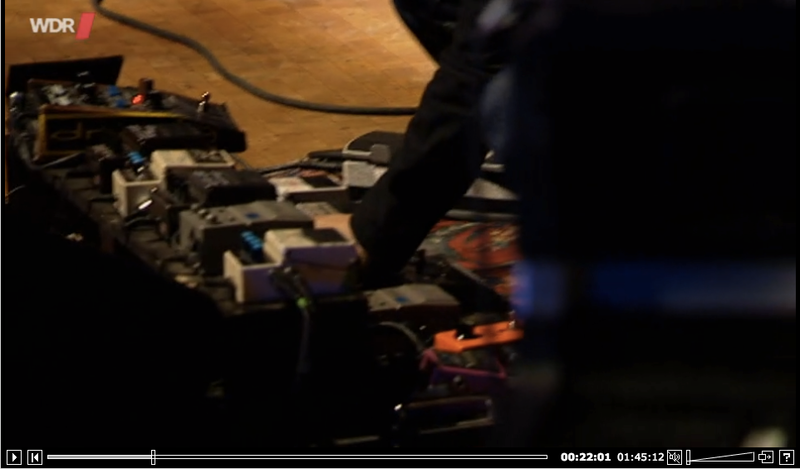 Between 21:59-22:01 of [this video](http://www1.wdr.de/fernsehen/kultur/rockpalast/videos/av/videodredginformation100_size-L.html), Mark starts to tinker with his pedalboard and we can see the Moog MF-102 effects pedal. 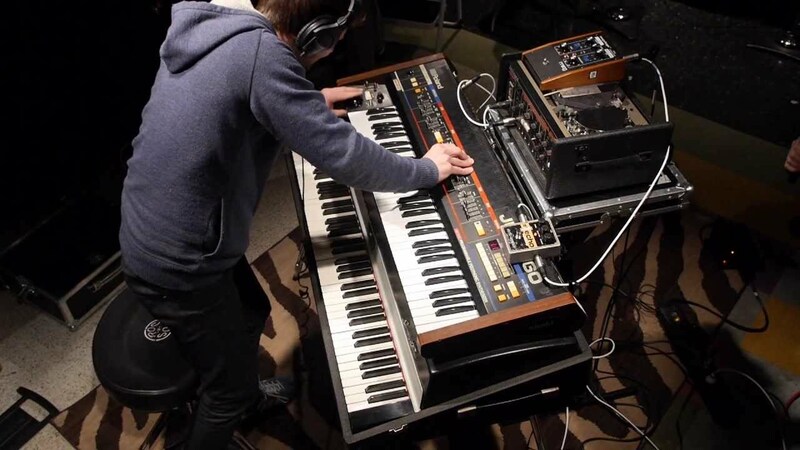 At 3:51 in the video, a MF-102 can be seen amongst Deacon's racks of Moogerfoogers. At the end of the Alabama Shakes' song "Dunes" you can hear the Moogerfooger ring mod frequency slowly coming in on a high-pass filter. This was the only source I could find, took a few weeks to find a source. 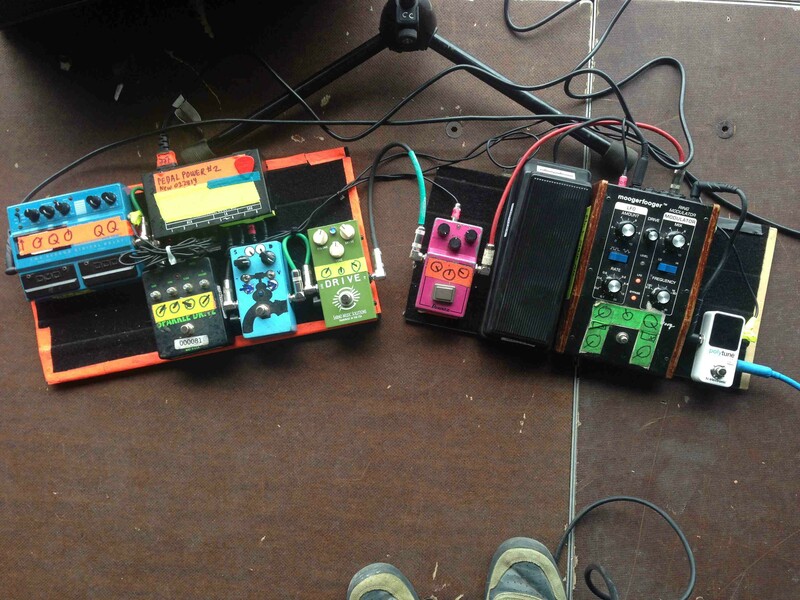 This was Laswell's list of pedals in 2014, in which this particular pedal can be found as well. "Ernie Ball Volume jr (passive pedal), Digitech Ex7-multi fx epression pedal (orchestra synth sound effect only), Crybaby Bass Wah, Moogerfooger Ring Modulator, Moogerfooger Murf, Digitech Whammy II, Electro Harmonix Bass Big Muff, Pigtronix Envelope Phaser, Digitech Bass Synth Wah, Dod Performer Wah Filter 545 (Beige), Boss DD3 Digital Delay, Boss DD7 Digital Delay/Looper"
Huelves uses a Moog MF-102, according to his [website](http://www.razlplanet.com/equipo/). It's right next to the crybaby pedal. 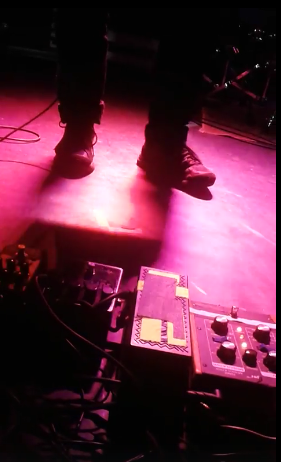 Ring modulator pedal used by Stroud. According to the gear list found along with Premier Guitar's interview with Wayne Krantz, he uses the Moog MF-102 ring modulator. You can see the Moog Moogerfooger MF-102 Ring Modulator at the :15-:19 second mark in the attached video. Second track of my new "Quadrashape" EP. All sounds: NI Reaktor 6, Elektron Analog Rytm, Moog Little Phatty, Moog Ringmodulator. VST Host / master clock: Ableton Live Recorded in live session without overdubs. This photo was taken on 2013 HEALTH concert in London. In this photo of Famiglietti with his pedalboard, one of the pedals in the pedalboard is the Moog MF-102 ring modulator pedal. The pedal was hard to identify because all the text is worn out. The Moog MF-102 can be seen on Graham's table at 09:35 in the video. The Moog Moogerfooger MF-102 Ring Modulator rebuilds your sound into two separate tones and then uses an internal carrier oscillator to spread those tones apart in the frequency spectrum. The higher the carrier frequency, the more the new tones are separated. The MF-102 serves up an astounding range of effects; from slow, velvet-smooth tremolo, to chains jangling in a Chinese gong, to classic "outer space" sounds. The LFO (Low Frequency Oscillator) imparts trills, vibratos, siren effects. You want unlimited new sounds? Well the MOOG MF-102 will do the job for you as it does with Ambarchi. During the interview, he said "and then one thing we did, which is kind of unusual, is that I used a Moog Ring Modulator on the song If I Get High. There’s a load of weird sonics and effects going on at the end of it and that was the Ring Mod with an expression pedal". You can ear the pedal being used throughout the whole song. Stain uses it everywhere I saw him. This gives also the wonderful tremolo part he plays in the song Sabkah on Nils Petter Molvaer's Hamada. Its second to last effect in the chain right behind the digitech whammy. He says he likes the drive knob and has that on all the time. The ring mod he engages only very seldom in songs. “These units are expensive, but annoyingly fresh. Me and Bibio [label mate and guitar guru] often riff on trying to make our, er, riffs ‘hairy’. You don’t ever want a bald synth sound. Moogerfoogers sort that right out. German guitarist Hanno Busch uses the Moog Moogerfooger MF-102 Ring Modulator as can be seen from this Instagram post of his. 1 of 4 Large Box MOOGERFOOGERS Luke Weiler of Positive Mental Trip is said to be tracking instrument (and vocal) parts with (in March/April 2019) is the MF 102 Ring Modulator. Almost every month multiple demos have been popping up on the PMT Bandcamp page. Most of these demos will become songs on the 3rd Positive Mental Trip album. On the bandcamp there are lists of what MOOG Pedals are tracked on Vocals, Drums, guitar, and Bass. Most likely Luke will use the Electro-Harmonix Ring Thing or the DOD Gonkulator to replicate the MOOG MF 102 Ring Modulator studio sounds live. The Moog MF-102 Ring Modulator is a direct descendant of the original Moog modular synthesizers. It contains three complete modular functions: a ring modulator, a voltage-controlled carrier oscillator, and voltage-controlled dual-waveform LFO. It can be used to process any instrument-level to line-level signal. A ring modulator produces sum and difference frequencies between the audio input and a carrier oscillator. The ring modulator's LFO can be used to modulate the carrier frequency. The Moogerfooger Ring Modulator can create effects ranging from subtle tremolo to harmonically rich distortion, gong-like sounds, sweeps, swoops, and divebombs. It can be subtle, or outlandish in its use - you decide! The Moogerfooger Ring Modulator's control parameters are signal mix, carrier frequency, LFO rate, and LFO amount. All of the ring modulator's parameters can be controlled by the great feeling knobs that beg to be tweaked as well as with expression pedals or external control voltages. Panel switches select LFO waveform and carrier frequency range. 1/4" jacks are provided for audio input and output, pedal/control inputs, carrier input and carrier output. The heavy-duty yet smooth acting bypass switch allows tabletop or floor use. Imagine that the ring modulator's carrier oscillator is producing a 500 Hz sine wave, and your input signal is a 100 Hz sine wave. The ring modulator's output will be a complex waveform. You will hear two pitches: 400 Hz and 600 Hz. You will not hear your original input or the carrier oscillator. Power supply is included for use with 110 VAC. Frequency rotary control, which varies the carrier frequency over a six-octave range. Rate rotary control, which varies the LFO's frequency from 0.1 Hz to 25 Hz. LFO Amount rotary control, which adjusts the amount that the LFO output sweeps the carrier oscillator. Mix rotary control, which crossfades continuously from unmodulated to modulated audio. Drive rotary control, which adjusts the gain of the audio input. Square-Sine rocker switch, which chooses the LFO waveform. Lo-Hi rocker switch, which chooses between the low frequency carrier range (2 Hz to 130 Hz) and the high frequency carrier range (60 Hz to 4,000 Hz). Level, a three-color LED that is used to set the DRIVE control. LFO, a LED that indicates the LFO rate. Bypoass, a two-color LED that tells whether the ring modulator is on or bypassed. I have started to use it on bus's however to give a nice LFO modulation to things like reverbs and such when Im trying to be creative. I don't use this as much as I wish TBH. I use it mostly in extended fx chains where I am already using on of my other mooger foogers. I hardly ever use this thing by itself. I have started to use it on bus's however to give a nice LFO modulation to things like reverbs and such when Im trying to be creative. A remarkable and greatsounding effect that is a lot more versatile than people think. this is the best thing i've ever played. i can tweak wisely from it. The MF-102 Ring Modulator is an award winning effect designed by Bob Moog. It contains an analog Ring Modulator with a built in Carrier Oscillator and LFO. Used with guitars, basses, keyboards, samples, or recorded tracks, the MF-102 can create subtle, or completely over-the-top effects. Uncontaminated by the digital world!